 Perceptive anecdotes from Austria, India, and Mexico, from heroin-addict treatment centers, scuba dives, and linguistics conferences pepper this primer on the intricacies of cross-cultural discourse and ordinary conversation. Coining the term ``languaculture'' to merge two somewhat ambiguous concepts into one slightly less uncertain term, Agar, a professor of linguistic anthropology (Univ. of Maryland, College Park), argues that language is not simply grammar and vocabulary (never mind phonology); that culture is as tangible and fluid as daily life; and that the two are intertwined--and often get snarled up. 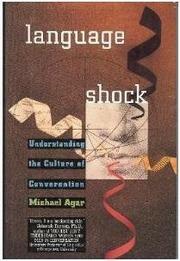 In his astute informal gloss of converging concepts in linguistics and cultural anthropology, Agar takes exception to the Berlitz notion of standardized phrases for generic situations as a means of getting along in foreign countries, as though communication merely involved set responses to set frames of reference. In his search for ethnographic ``rich points'' (where native and non-native speakers are likely to trip themselves up), Agar sometimes fixes on commonplace words that have particular cultural significance but slippery definitions. In one instance, while working in Vienna, he spent some free time trying to find the meaning of SchmÑha sort of defensive irony, or sly black humor, or slick equivocation. One student gave the example of Austrian-born Marie Antoinette's infamous ``Let them eat cake'' as typical SchmÑh; but though Marie's French was perfect grammatically, the sans-culottes still did not catch on to her intention, which was not to mock the lower classes but to deflect the tension of the situation through humor. Speech acts--more general forms of social discourse like joking or lying--can be more slippery still for both speakers and society, as Agar demonstrates in an analysis of Kurt Waldheim's rationalizations of his Nazi collaboration. If his discussion of scholarship tends to skim over important figures and ideas (such as Wittgenstein and anthropologist Harold Garfinkel) and his original insights are slight by comparison, his presentation is readable and his observations engaging. A stimulating personal reflection on the complexities of communication between people, in whatever language or culture.